Public health practitioners have attempted to look at substance use from a broader perspective than the individual, emphasizing the role of society, culture, and availability. Some health professionals choose to avoid the terms alcohol or drug “abuse” in favor of language they consider more objective, such as “substance and alcohol type problems” or “harmful/problematic use” of drugs. The Health Officers Council of British Columbia — in their 2005 policy discussion paper, A Public Health Approach to Drug Control in Canada — has adopted a public health model of psychoactive substance use that challenges the simplistic black-and-white construction of the binary (or complementary) antonyms “use” vs. “abuse”. This model explicitly recognizes a spectrum of use, ranging from beneficial use to chronic dependence. ‘Drug abuse’ is no longer a current medical diagnosis in either of the most used diagnostic tools in the world, the American Psychiatric Association‘s Diagnostic and Statistical Manual of Mental Disorders (DSM), and the World Health Organization‘s International Statistical Classification of Diseases (ICD). Philip Jenkins suggests that there are two issues with the term “drug abuse”. First, what constitutes a “drug” is debatable. For instance, GHB, a naturally occurring substance in the central nervous system is considered a drug, and is illegal in many countries, while nicotine is not officially considered a drug in most countries. Prescription misuse has been defined differently and rather inconsistently based on status of drug prescription, the uses without a prescription, intentional use to achieve intoxicating effects, route of administration, co-ingestion with alcohol, and the presence or absence of dependence symptoms. Chronic use of certain substances leads to a change in the central nervous system known as a ‘tolerance’ to the medicine such that more of the substance is needed in order to produce desired effects. With some substances, stopping or reducing use can cause withdrawal symptoms to occur, but this is highly dependent on the specific substance in question. The rate of prescription drug use is fast overtaking illegal drug use in the United States. According to the National Institute of Drug Abuse, 7 million people were taking prescription drugs for nonmedical use in 2010. Among 12th graders, nonmedical prescription drug use is now second only to cannabis. In 2011, “Nearly 1 in 12 high school seniors reported nonmedical use of Vicodin; 1 in 20 reported such use of OxyContin.” Both of these drugs contain opioids. Avenues of obtaining prescription drugs for misuse are varied: sharing between family and friends, illegally buying medications at school or work, and often “doctor shopping” to find multiple physicians to prescribe the same medication, without knowledge of other prescribers. Increasingly, law enforcement is holding physicians responsible for prescribing controlled substances without fully establishing patient controls, such as a patient “drug contract.” Concerned physicians are educating themselves on how to identify medication-seeking behavior in their patients, and are becoming familiar with “red flags” that would alert them to potential prescription drug abuse. …’use’ refers to the proper place of stimulants in medical practice; ‘misuse’ applies to the physician’s role in initiating a potentially dangerous course of therapy; and ‘abuse’ refers to self-administration of these drugs without medical supervision and particularly in large doses that may lead to psychological dependency, tolerance and abnormal behavior. …drug abuse may refer to any type of drug or chemical without regard to its pharmacologic actions. It is an eclectic concept having only one uniform connotation: societal disapproval. … The Commission believes that the term drug abuse must be deleted from official pronouncements and public policy dialogue. The term has no functional utility and has become no more than an arbitrary codeword for that drug use which is presently considered wrong. The first edition of the American Psychiatric Association‘s Diagnostic and Statistical Manual of Mental Disorders (published in 1952) grouped alcohol and drug abuse under Sociopathic Personality Disturbances, which were thought to be symptoms of deeper psychological disorders or moral weakness. The third edition, published in 1980, was the first to recognize substance abuse (including drug abuse) and substance dependence as conditions separate from substance abuse alone, bringing in social and cultural factors. The definition of dependence emphasised tolerance to drugs, and withdrawal from them as key components to diagnosis, whereas abuse was defined as “problematic use with social or occupational impairment” but without withdrawal or tolerance. The fifth edition of the DSM (DSM-5), was released in 2013, and it revisited this terminology. The principal change was a transition from the abuse/dependence terminology. In the DSM-IV era, abuse was seen as an early form or less hazardous form of the disease characterized with the dependence criteria. However, the APA’s ‘dependence’ term, as noted above, does not mean that physiologic dependence is present but rather means that a disease state is present, one that most would likely refer to as an addicted state. Many involved recognize that the terminology has often led to confusion, both within the medical community and with the general public. The American Psychiatric Association requested input as to how the terminology of this illness should be altered as it moves forward with DSM-5 discussion. In the DSM-5, substance abuse and substance dependence have been merged into the category of substance use disorders and they now longer exist as individual concepts. While substance abuse and dependence were either present or not, substance use disorder has three levels of severity: mild, moderate and severe. Most governments have designed legislation to criminalize certain types of drug use. These drugs are often called “illegal drugs” but generally what is illegal is their unlicensed production, distribution, and possession. These drugs are also called “controlled substances”. Even for simple possession, legal punishment can be quite severe (including the death penalty in some countries). Laws vary across countries, and even within them, and have fluctuated widely throughout history. Attempts by government-sponsored drug control policy to interdict drug supply and eliminate drug abuse have been largely unsuccessful. In spite of the huge efforts by the U.S., drug supply and purity has reached an all-time high, with the vast majority of resources spent on interdiction and law enforcement instead of public health. In the United States, the number of nonviolent drug offenders in prison exceeds by 100,000 the total incarcerated population in the EU, despite the fact that the EU has 100 million more citizens. As part of the reporting exercise corresponding to 2005, the European Monitoring Centre for Drugs and Drug Addiction’s network of national focal points set up in the 27 European Union (EU) Member States, Norway, and the candidates countries to the EU, were requested to identify labeled drug-related public expenditure, at the country level. 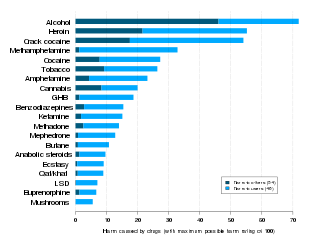 The UK Home Office estimated that the social and economic cost of drug abuse to the UK economy in terms of crime, absenteeism and sickness is in excess of £20 billion a year. However, the UK Home Office does not estimate what portion of those crimes are unintended consequences of drug prohibition (crimes to sustain expensive drug consumption, risky production and dangerous distribution), nor what is the cost of enforcement. Those aspects are necessary for a full analysis of the economics of prohibition. Immigrant and refugees have often been under great stress, physical trauma and depression and anxiety due to separation from loved ones often characterize the pre-migration and transit phases, followed by “cultural dissonance,” language barriers, racism, discrimination, economic adversity, overcrowding, social isolation, and loss of status and difficulty obtaining work and fears of deportation are common. Refugees frequently experience concerns about the health and safety of loved ones left behind and uncertainty regarding the possibility of returning to their country of origin. For some, substance abuse functions as a coping mechanism to attempt to deal with these stressors. ^ a b c d e f g Nutt, D.; King, L. A.; Saulsbury, W.; Blakemore, C. (2007). “Development of a rational scale to assess the harm of drugs of potential misuse”. The Lancet. 369 (9566): 1047–1053. doi:10.1016/S0140-6736(07)60464-4. PMID 17382831. ^ a b c “World Drug Report 2012” (PDF). UNITED NATIONS. Retrieved 27 September 2016. ^ a b “EMCDDA | Information on the high-risk drug use (HRDU) (formerly ‘problem drug use’ (PDU)) key indicator”. www.emcdda.europa.eu. Retrieved 2016-09-27. ^ a b c GBD 2015 Mortality and Causes of Death, Collaborators. (8 October 2016). “Global, regional, and national life expectancy, all-cause mortality, and cause-specific mortality for 249 causes of death, 1980–2015: a systematic analysis for the Global Burden of Disease Study 2015”. Lancet. 388 (10053): 1459–1544. doi:10.1016/S0140-6736(16)31012-1. PMC 5388903. PMID 27733281. ^ (2002). Mosby’s Medical, Nursing & Allied Health Dictionary. Sixth Edition. Drug abuse definition, p. 552. Nursing diagnoses, p. 2109. ISBN 0-323-01430-5. ^ “Addiction is a Chronic Disease”. Archived from the original on 24 June 2014. Retrieved 2 July 2014. ^ “A Public Health Approach” (PDF). Retrieved 1 April 2017. ^ Nutt, David J; King, Leslie A; Phillips, Lawrence D (November 2010). 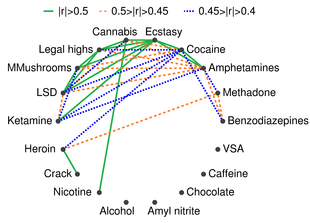 “Drug harms in the UK: a multicriteria decision analysis”. The Lancet. 376 (9752): 1558–1565. CiteSeerX 10.1.1.690.1283. doi:10.1016/S0140-6736(10)61462-6. PMID 21036393. ^ Barrett SP, Meisner JR, Stewart SH (November 2008). “What constitutes prescription drug misuse? Problems and pitfalls of current conceptualizations” (PDF). Curr Drug Abuse Rev. 1 (3): 255–62. doi:10.2174/1874473710801030255. PMID 19630724. Archived from the original (PDF) on 2010-06-15. ^ McCabe SE, Boyd CJ, Teter CJ (June 2009). “Subtypes of nonmedical prescription drug misuse”. Drug Alcohol Depend. 102 (1–3): 63–70. doi:10.1016/j.drugalcdep.2009.01.007. PMC 2975029. PMID 19278795. ^ “The Prescription Drug Abuse Epidemic”. PDMP Center of Excellence. 2010–2013. ^ “Topics in Brief: Prescription Drug Abuse” NIDA, December 2011. ^ “Combating Prescription Drug Abuse in Your Practice” Archived 2012-06-18 at the Wayback Machine Aubrey Westgate, Physicians Practice, June 2012. ^ Burke PJ, O’Sullivan J, Vaughan BL (November 2005). “Adolescent substance use: brief interventions by emergency care providers”. Pediatr Emerg Care. 21 (11): 770–6. doi:10.1097/01.pec.0000186435.66838.b3. PMID 16280955. ^ O’Connor, Rory; Sheehy, Noel (29 January 2000). Understanding suicidal behaviour. Leicester: BPS Books. pp. 33–36. ISBN 978-1-85433-290-5. ^ Di Forti M, Marconi A, Carra E, Fraietta S, Trotta A, Bonomo M, Bianconi F, Gardner-Sood P, O’Connor J, Russo M, Stilo SA, Marques TR, Mondelli V, Dazzan P, Pariante C, David AS, Gaughran F, Atakan Z, Iyegbe C, Powell J, Morgan C, Lynskey M, Murray RM (2015). “Proportion of patients in south London with first-episode psychosis attributable to use of high potency cannabis: a case-control study” (PDF). Lancet Psychiatry. 2 (3): 233–8. doi:10.1016/S2215-0366(14)00117-5. PMID 26359901. ^ Marta Di Forti (17 December 2013). “Daily Use, Especially of High-Potency Cannabis, Drives the Earlier Onset of Psychosis in Cannabis Users”. Schizophrenia Bulletin. 40 (6): 1509–1517. doi:10.1093/schbul/sbt181. PMC 4193693. PMID 24345517. ^ “Impulsivity”. The Free Dictionary. ^ Bishara AJ, Pleskac TJ, Fridberg DJ, Yechiam E, Lucas J, Busemeyer JR, Finn PR, Stout JC (2009). “Similar Processes Despite Divergent Behavior in Two Commonly Used Measures of Risky Decision Making”. J Behav Decis Mak. 22 (4): 435–454. doi:10.1002/bdm.641. PMC 3152830. PMID 21836771. ^ Chambers RA, Taylor JR, Potenza MN (2003). “Developmental neurocircuitry of motivation in adolescence: a critical period of addiction vulnerability”. Am J Psychiatry. 160 (6): 1041–52. doi:10.1176/appi.ajp.160.6.1041. PMC 2919168. PMID 12777258. ^ O’Donohue, W; K.E. Ferguson (2006). “Evidence-Based Practice in Psychology and Behavior Analysis”. The Behavior Analyst Today. 7 (3): 335–350. doi:10.1037/h0100155. Retrieved 2008-03-24. ^ Chambless, D.L. ; et al. (1998). “An update on empirically validated therapies” (PDF). Clinical Psychology. 49: 5–14. Retrieved 2008-03-24. ^ “NIH Senior Health “Build With You in Mind”: Survey”. nihseniorhealth.gov. Archived from the original on 2015-08-11. Retrieved 29 July 2015. ^ “Association for Behavioral and Cognitive Therapies – What is CBT?”. Archived from the original on 2010-04-21. ^ “Association for Behavioral and Cognitive Therapies – What is Family Therapy?”. Archived from the original on 2010-06-13. ^ a b Hogue, A; Henderson, CE; Ozechowski, TJ; Robbins, MS (2014). “Evidence base on outpatient behavioral treatments for adolescent substance use: updates and recommendations 2007–2013”. Journal of Clinical Child and Adolescent Psychology. 43 (5): 695–720. doi:10.1080/15374416.2014.915550. PMID 24926870. ^ “Association for Behavioral and Cognitive Therapies – Treatment for Substance Use Disorders”. Archived from the original on 2010-04-21. ^ Engle, Bretton; Macgowan, Mark J. (2009-08-05). “A Critical Review of Adolescent Substance Abuse Group Treatments”. Journal of Evidence-Based Social Work. 6 (3): 217–243. doi:10.1080/15433710802686971. ISSN 1543-3714. PMID 20183675. ^ a b “Maternal substance use and integrated treatment programs for women with substance abuse issues and their children: a meta-analysis”. www.crd.york.ac.uk. Retrieved 2016-03-09. ^ Carney, Tara; Myers, Bronwyn J; Louw, Johann; Okwundu, Charles I (2016-01-20). “Brief school-based interventions and behavioural outcomes for substance-using adolescents”. Cochrane Database of Systematic Reviews (1): CD008969. doi:10.1002/14651858.cd008969.pub3. PMID 26787125. ^ Jensen, Chad D.; Cushing, Christopher C.; Aylward, Brandon S.; Craig, James T.; Sorell, Danielle M.; Steele, Ric G. (2011). “Effectiveness of motivational interviewing interventions for adolescent substance use behavior change: A meta-analytic review”. Journal of Consulting and Clinical Psychology. 79 (4): 433–440. doi:10.1037/a0023992. PMID 21728400. ^ Barnett, Elizabeth; Sussman, Steve; Smith, Caitlin; Rohrbach, Louise A.; Spruijt-Metz, Donna (2012). “Motivational Interviewing for adolescent substance use: A review of the literature”. Addictive Behaviors. 37 (12): 1325–1334. doi:10.1016/j.addbeh.2012.07.001. PMC 3496394. PMID 22958865. ^ “Self-Help Groups Article”. Retrieved May 27, 2015. ^ Uekermann J, Daum I (May 2008). “Social cognition in alcoholism: a link to prefrontal cortex dysfunction?”. Addiction. 103 (5): 726–35. doi:10.1111/j.1360-0443.2008.02157.x. PMID 18412750. ^ Purvis G.; MacInnis D. M. (2009). “Implementation of the Community Reinforcement Approach (CRA) in a Long-Standing Addictions Outpatient Clinic” (PDF). Journal of Behavior Analysis of Sports, Health, Fitness and Behavioral Medicine. 2: 133–44. Archived from the original (PDF) on 2010-12-29. ^ “Current Pharmacological Treatment Available for Alchhol Abuse”. The California Evidence-Based Clearinghouse. 2006–2013. ^ Maglione, M; Maher, AR; Hu, J; Wang, Z; Shanman, R; Shekelle, PG; Roth, B; Hilton, L; Suttorp, MJ; Ewing, BA; Motala, A; Perry, T (September 2011). “Off-Label Use of Atypical Antipsychotics: An Update [Internet]”. Agency for Healthcare Research and Quality (US). PMID 22132426. Report No. : 11-EHC087-EF. ^ Lingford-Hughes AR, Welch S, Peters L, Nutt DJ, British Association for Psychopharmacology, Expert Reviewers Group (2012-07-01). “BAP updated guidelines: evidence-based guidelines for the pharmacological management of substance abuse, harmful use, addiction and comorbidity: recommendations from BAP”. Journal of Psychopharmacology. 26 (7): 899–952. doi:10.1177/0269881112444324. ISSN 0269-8811. PMID 22628390. ^ a b Lingford-Hughes A. R.; Welch S.; Peters L.; Nutt D. J. (2012). “BAP updated guidelines: evidence-based guidelines for the pharmacological management of substance abuse, harmful use, addiction and comorbidity: recommendations from BAP” (PDF). Journal of Psychopharmacology. 26 (7): 899–952. doi:10.1177/0269881112444324. PMID 22628390. Archived from the original (PDF) on 2012-12-03. ^ a b Peterson Ashley L (2013). “Integrating Mental Health and Addictions Services to Improve Client Outcomes”. Issues in Mental Health Nursing. 34 (10): 752–756. doi:10.3109/01612840.2013.809830. PMID 24066651. ^ “CDC Newsroom Press Release June 3, 2010”. ^ “Drug Trade“. BBC News. ^ Glasscote, R.M., Sussex, J.N., Jaffe, J.H., Ball, J., Brill, L. (1932). The Treatment of Drug Abuse for people like you…: Programs, Problems, Prospects. Washington, D.C.: Joint Information Service of the American Psychiatric Association and the National Association for Mental Health. ^ Hasin, Deborah S.; O’Brien, Charles P.; Auriacombe, Marc; Borges, Guilherme; Bucholz, Kathleen; Budney, Alan; Compton, Wilson M.; Crowley, Thomas; Ling, Walter (2013-08-01). “DSM-5 Criteria for Substance Use Disorders: Recommendations and Rationale”. American Journal of Psychiatry. 170 (8): 834–851. doi:10.1176/appi.ajp.2013.12060782. ISSN 0002-953X. PMC 3767415. PMID 23903334. ^ “Diagnostic and Statistical Manual of Mental Disorders: DSM-5 (5th edition)2014 102 Washington, DC American Psychiatric Association 2013 xliv+947 pp. 9780890425541(hbck);9780890425558(pbck) £175 $199 (hbck); £45 $69 (pbck)”. Reference Reviews. 28 (3): 36–37. 11 March 2014. doi:10.1108/rr-10-2013-0256. ^ Copeman M (April 2003). “Drug supply and drug abuse”. CMAJ. 168 (9): 1113, author reply 1113. PMC 153673. PMID 12719309. Archived from the original on 2009-09-06. ^ Wood E, Tyndall MW, Spittal PM, et al. (January 2003). “Impact of supply-side policies for control of illicit drugs in the face of the AIDS and overdose epidemics: investigation of a massive heroin seizure”. CMAJ. 168 (2): 165–9. PMC 140425. PMID 12538544. ^ a b c Prieto L (2010). “Labelled drug-related public expenditure in relation to gross domestic product (gdp) in Europe: A luxury good?”. Substance Abuse Treatment, Prevention, and Policy. 5: 9. doi:10.1186/1747-597x-5-9. PMC 2881082. PMID 20478069. ^ “NHS and Drug Abuse”. National Health Service (NHS). March 22, 2010. Retrieved March 22, 2010. ^ “Home Office | Tackling Drugs Changing Lives | Drugs in the workplace”. 2007-06-09. Archived from the original on 2007-06-09. Retrieved 2016-09-19. ^ Thornton, Mark. “The Economics of Prohibition”. ^ Owens PL, Barrett ML, Weiss AJ, Washington RE, Kronick R (August 2014). “Hospital Inpatient Utilization Related to Opioid Overuse Among Adults, 1993–2012”. HCUP Statistical Brief #177. Rockville, MD: Agency for Healthcare Research and Quality. ^ Drachman, D. (1992). “A stage-of-migration framework for service to immigrant populations”. Social Work. 37 (1): 68–72. doi:10.1093/sw/37.1.68. ^ Pumariega A. J.; Rothe E.; Pumariega J. B. (2005). “Mental health of immigrants and refugees”. Community Mental Health Journal. 41 (5): 581–597. CiteSeerX 10.1.1.468.6034. doi:10.1007/s10597-005-6363-1. PMID 16142540. ^ Caetano R.; Clark C. L.; Tam T. (1998). “Alcohol consumption among racial/ethnic minorities: Theory and research”. Journal of Alcohol, Health, and Research. 22 (4): 233–241. ^ UNODC. “Understanding Substance Use Among Street Children” (PDF). Retrieved 30 January 2014. ^ Cottrell-Boyce, Joe (2010). “THE ROLE OF SOLVENTS IN THE LIVES OF STREET CHILDREN” (PDF). African Journal of Drug & Alcohol Studies. 9 (2): 93–102. doi:10.4314/ajdas.v9i2.64142. Retrieved 28 January 2014. ^ a b c d Breitenfeld D.; Thaller V.; Perić B.; Jagetic N.; Hadžić D.; Breitenfeld T. (2008). “Substance abuse in performing musicians”. Alcoholism: Journal on Alcoholism and Related Addictions. 44 (1): 37–42. ^ “Treatment Programs for Substance Use Problems – Mental Health”. www.mentalhealth.va.gov. Retrieved 2016-12-17.